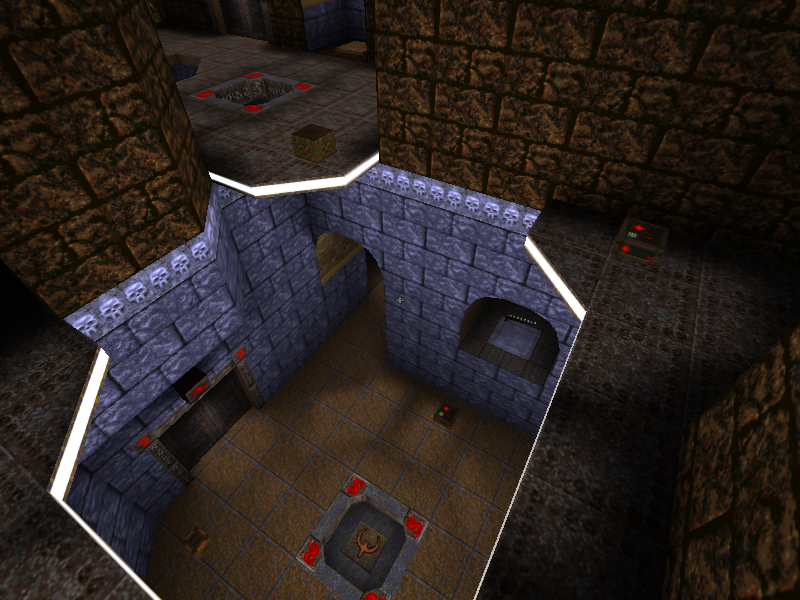 A new, brightly lit Deathmatch map with vertical play, elevators, hatches, and plenty of lava. Basic layout inspired by Lividus, created by dumptruck_ds (link below), referenced with his permission. Took the visual design in a different direction. 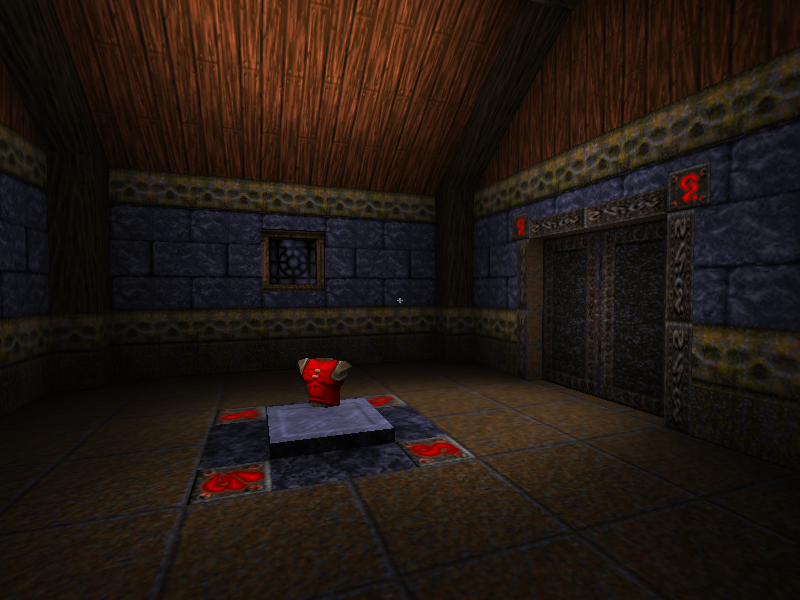 Required a few new textures to get the look I wanted. Source is included in the download (map and texture wad). Layout moved toward enhancing connectivity as I went along. Found some interesting ways to keep things flowing. Requires a Quake client with increased limits. It works in WinQuake, etc, but flickers due to exceeding surface limits. 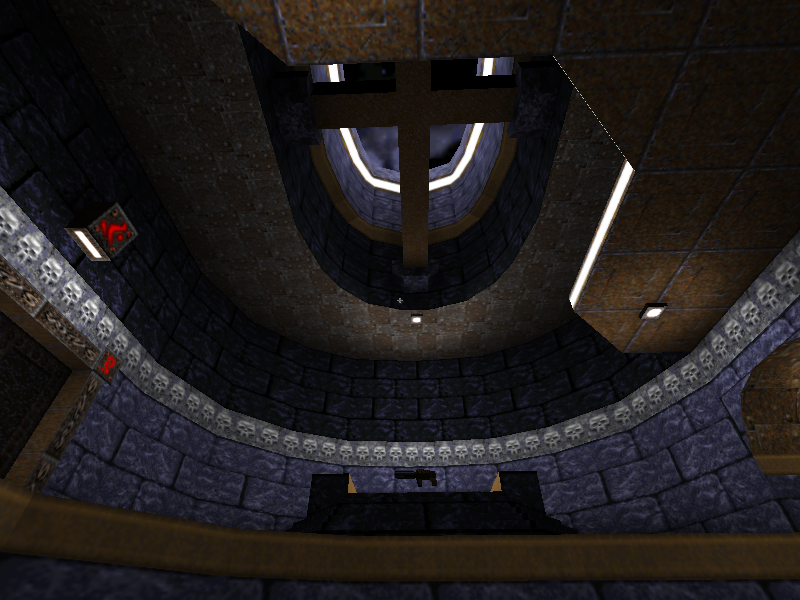 Tested in Quakespasm and ezQuake/nQuake, and everything seems to look fine and work there. Includes a colored lighting file, but still looks good without it, if your DM client of choice doesn't automatically download lit files. I wasn't able to implement all the feedback I got, but planning to take some of the lessons and ideas forward into my next map. Already got some ideas on what I want to make. This is fine in WinQuake if the player has bumped up r_maxedges and r_maxsurfs a little bit in their config, which really should be standard practice. The WinQuake defaults will cause greyed out surfaces on most things built past 1997. Ah, good to know! Thank you. I didn't know the original executables were flexible like that. I'll adjust my readme files accordingly. I don't play DM but this is one good looking map. Kudos! The lavafalls look rather odd; they use the standard *lava texture which is remotely acceptable in classic/oldschool maps in a suspension of disbelief kind of way, but in this case they have a more intricate (smooth/roundish) shape. The problem with this is that one can't align liquid textures across multiple faces to match perfectly in their animation. I don't know if this is an engine or a tool limitation. At any rate, this creates a visual anomaly where you can clearly see the mismatching animation on each face. The solution (or workaround) is putting a func_illusionary with an animated lavafall texture around the actual lava volumes. There's one in mappi2 (crude animation but does the job AND is alignable) and one used in mapjam6 (which doesn't look good on big surfaces). The brushwork is this map is a bit awkward. Often times, walls are made up of several brushes that go all over the place or partially appear in another room as well. Better to use clean brushwork - makes it easier to work with or reiterate things afterwards. Not to mention potential compiler trouble. The map does compile fine, though. Also careful with texturelock/valve220. This may produce (technically or visually) unwanted results. Qbsp tries to merge same-textured faces on the same plane as best as possible, but if there a different texture offsets, even if largely invisible to the human eye, they'll be treated as indidual faces and split accordingly. Always good to watch out for potential clipping hazards, especially in a deathmatch map. Now, there isn't much problematic geometry in this map, I only found three mostly minor things: the lights in the rocky outside area are something to get stuck on in a fight. It's a good idea to turn things like that (if they are small/flat enough so that the player can't look inside) into func_illusionary or func_detail_illusionary. Another reoccuring problem in Quake is random clipping issues on corners where a straight wall and a 45 degree wall meet. Sometimes one needs to put a small clip wedge there to fix it. The sides of arches can stop the player, too, if they are too low. Even though the player's bounding box is only 56, they'll stick get stuck where the angled arch brush meets the wall if there's less than ~72 units of vertical space. I always hump the walls before releasing a map to try and find such clipping spots. Like I mentioned earlier, the lighting is very bright (on my setup). 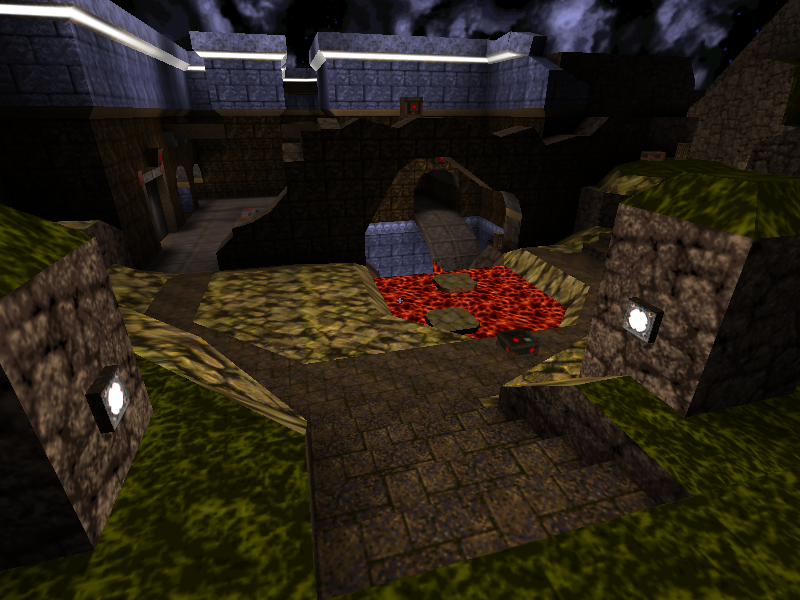 Of course, Obviously you don't want a deathmatch map to be too dark. But you generously used "delay 2" on most lights which may not be the best approach. It has a larger attenuation so even a single light can easily illuminate 'too much' and leave little room for contrast. There are some areas that look fairly over-saturated. I don't really have a proper recommendation, though - maybe try -bounce on light.exe next time if you want to keep a low number of light entities. Since you included the map source, I spent some time playing around with it a little and tweaked some of the things mentioned above. And while at it, I also threw in a couple of monsters for some extra fun! Hey! I just caught up with the mapping notes. Thanks for being so thorough. I've definitely noticed the strange clipping issues before, but didn't know the cause or workarounds for those angles. I'll be sure to ask questions next time if I run into it and can't figure out how to resolve those. On lighting, I'm experimenting quite a bit to see how much color and brightness I can get away with. If this one's over the line a bit, I'll reel it in next time. negke does all the work and I still get thanked! Just played it, took me three tries to get through. The boss fight was hilarious! Also took me a while to sort out where to shoot, but thankfully there were sound cues and respawning rockets to help that process. I think I only found 2 or 3 secrets. Didn't get the Quad or the SuperNailgun. I found one button of a sequence secret, but didn't complete it. All sorts of good stuff. Really like how you arranged progress through the map. Well done! Hail to the King! The bit with the throne was delightful.